It’s 4/20 – the day when marijuana fans worldwide celebrate their recreational substance of choice and often lobby for its legalization. In New Jersey, marijuana remains illegal except for a limited number of medical conditions – and even then, a fee is imposed if it is to be used. Gov. Chris Christie has been staunchly against legalization, once declaring at press conference in Seaside Park that “quack doctors” wouldn’t prescribe it to recreational users in his state. But times are changing. With Christie in his final year in office, several candidates for his seat are in support of legalization. Democrat Phil Murphy has endorsed legalizing marijuana and John Wisniewski has supported its decriminalization. 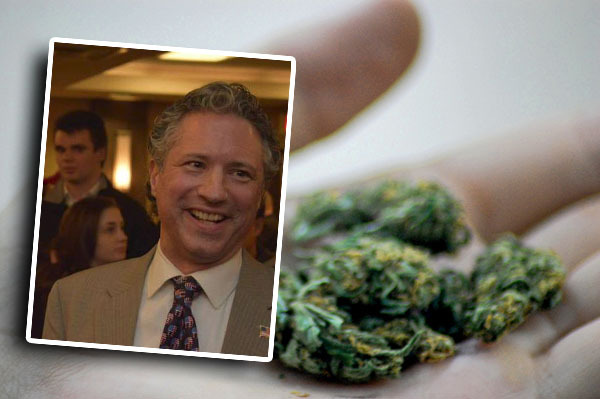 But only one Republican candidate – Ocean County’s Joseph “Rudy” Rullo – has come out in favor of full-on legalization. Rullo said he neither smokes nor drinks, but doesn’t feel the law should stop others from doing so. Rullo said he would like to see a recreational marijuana industry generate revenue not just through sales taxes, but through its growth and export. Being able to grow marijuana in-state would be a boon to New Jersey’s farmers, he said. Under his plan, Rullo would earmark a portion of marijuana-based tax revenue to fund law enforcement, a portion to fund transportation projects and a portion to meet the state’s public employee pension obligations. He also said the state would save money by way of eliminating marijuana-based cases clogging up courts and offenders taking up spaces in jails. Last November, voters in California, Massachusetts, Nevada and Maine approved the legalization of recreational marijuana, while several other states approved it for medical use. While legal in those states, marijuana is still a federally banned substance, and newly-appointed Attorney General Jeff Sessions has made no secret of his opposition to legalization. Still, Rullo said he does not feel legalization would endanger public safety. “You don’t hear about people beating up others at bars while they’re on pot,” he said.